Last weekend the third league Austrian club First Vienna played their last home game of the season. Visiting players of ASK Ebreichsdorf were treated to a very nice display in the stands before losing painfully 1:4. Supporters weren’t waiting for players to give their performance and they prepared an impressive choreography themselves, one that took several weeks to prepare. 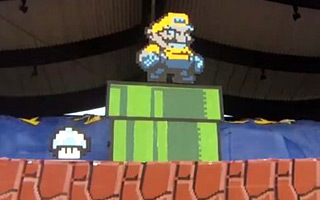 In the east stand of Hohe Warte a large Super Mario scenery was created, depicting the pixel-world very well. Then of course came Super Mario, who defeated all odds (we never understood why mushrooms were evil, though) and triumphed, as you can see in the below video. While the display is simply fun to watch, First Vienna aren’t triumphant just yet. The team have exactly as many points in the league as leading SV Horn (66), but trail on goal differential. The only way for them to win first spot and promotion to Erste Liga is to get more points in the last game of the season. If both First Vienna and SV Horn win, the Viennese club would have to defeat their rivals by an almost-impossible margin of 7 or more goals. Super Mario would come in handy!